look what i got in the mail!!!!!!!!!! my newest junk partner in crime, somavenus sent me this INCREDiBLE package of goodies. my heart nearly exploded when i opened it. this girl is nothing short of genius! not only is she an amazing artist in her own right, she plucked out all these found objects for me to use in my art. how she ever parted with them i'll never know. 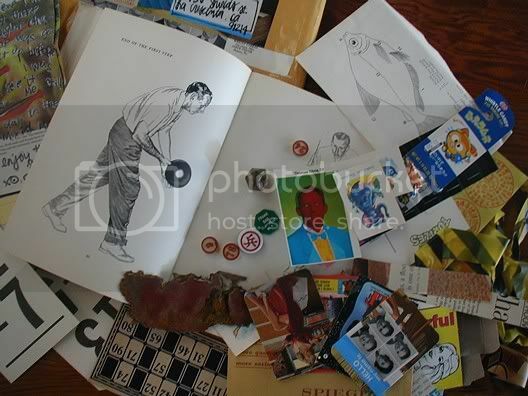 everything from a hard bound copy of '10 secrets of bowling,' (thanks to her, my 'zen of bowling' series can now be DOUBLED!) to a piece of decayed car metal she kiped from a walmart parking lot. she delighted in the fact that no one else had picked it up before her..now that's MY kinda gal. as much as i'd love to live near her, i know we'd be fighting over who gets what on our daily walks in the neighborhood. thank you so much somavenus...you're my angel with happy hair. i'm prolly due for another tetanus shot! you're too right. I laughed.. i cried -- thinking about what would happen if we were in the same town... it's MINE! I SAW IT FIRST! I was so excited to see that piece of car still sitting safe and sound in the parking lot -- i can't believe i thought someone would actually take it.. ha! got your email and i lovvvvvve the trade idea.. i'll email you back soon!!! you are SUCH a good egg!!!!!!! and my wheels are a turnin' thinking up all sorts of goodies to send YOUR way. aces on the trade. i'll look forward to that. goody goody gumdrops! and good luck with your walk for life ceremony tomorrow..i'll be thinkin' of you and sis.. I found you through her journal req. yup, that girl's a sweetie pie, alright..
i added you back, btw. awesomeness! what a lovely surprise....! just like x-mas morn, it was..
she even sent me unopened new kids on the block trading cards!!!!!!!!!!! the rine in spine falls minely on the pline..
i'm so happy you like that book as much as i liked making it!!! probably due out this winter..
and you just got published yourself mister!!!!!! congrats to YOU!!! poor chuck has to work for half of our NY stay, wah. but, i'll be out stompin' while he's shut in madison square with all the WB big wigs. hope to see you soon after we get back!! !